The term sling can refer to one of two configurations for lifting and hoisting apparatus. 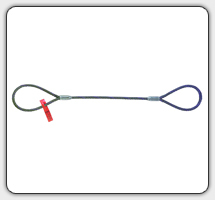 Slings as wire rope fittings involve the addition of a loop at the end of a length of wire through which hooks and other apparatus may be looped or fastened. The term may also apply to a length of cable that has this same “U” or teardrop-shaped eye, but on either end of the cable. In the case of the “U” shaped sling, lifting is accomplished by firmly attaching the eyes to a hook or hoist, though both ends are then simultaneously lifted in order to wrap around or cradle the supplies or finished goods to be lifted. 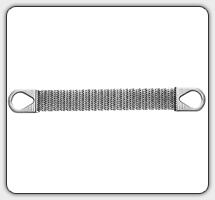 Unlike synthetic or fiber slings, wire rope offers increased resistance to wear and abrasion and can be used for both hot and cold materials as well as in corrosive applications such as those in marine, construction, aerospace, manufacturing, assembly, transport, shipping, and other industries where wire rope slings are commonly used. Wire ropes fitted with slings in these applications also serve to improve connectivity and prevent fraying of the rope. Though the majority have predetermined dimensions, they may be adjustable to accommodate a change in the size of cargo while maintaining a secure fit. Like stranded wire ropes, the slings that they attach too are strictly regulated and must be inspected regularly as mechanical failure puts both machinery and employees at serious risk. To prevent such disruptions, it is important to select the proper sling for a given application. Slings are most commonly constructed simply by looping or folding the end of a wire rope back onto itself and holding it in place with a firm fitting such as a clamp. Alternatively, the folded segment of wire may be braided or twisted along the main body of rope and otherwise held in place through welding or similar processes. The rope itself is comprised of cold drawn filaments that are twisted or braided into strands which in turn are helically wrapped around a core. The multilayered formation of wire rope acts as a safety measure as individual strands are more likely to fail than the rope as a whole, allowing the other strands to act as a backup. Popular materials for wire rope and sling construction include aluminum, nickel alloy, bronze, copper, and titanium, although steel and stainless steel are the most common due to their increased strength and availability. Additional considerations include the wire rope sling’s dimensions, fatigue strength, its ability to bend without distortion, to withstand abrasion, and environmental conditions as well as the intended use for the sling. Wire rope slings are stress tested during manufacturing to determine breaking point and safe usage guidelines which should be carefully considered. Wire Rope Slings Wire rope slings are common components of wire rope assemblies that serve as a point of attachment for cranes, hooks, and hoists in many heavy lifting or pulling applications.